The Takahe or South Island Takahe, Porphyrio hochstetteri, is a flightless bird indigenous to New Zealand and belonging to the rail family. It was thought to be extinct after the last four known specimens were taken in 1898. However, after a carefully planned search effort the bird was rediscovered by Geoffrey Orbell near Lake Te Anau in the Murchison Mountains, South Island, on November 20, 1948. The specific scientific name commemorates the Austrian geologist Ferdinand von Hochstetter. 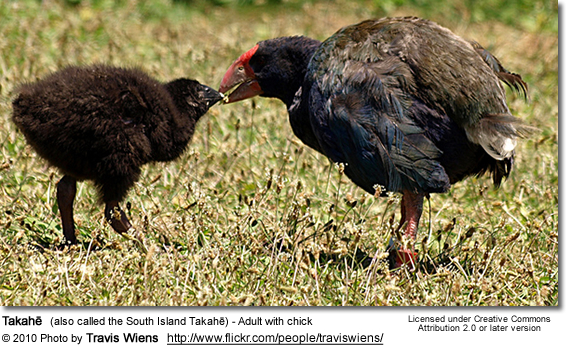 A related species, the North Island Takahe (P. mantelli) or mōho is extinct and only known from skeletal remains. Both forms were long assumed to be subspecies of mantelli and were usually placed in the genus Notornis. However, it has been determined that the differences between Porphyrio and Notornis were insufficient for separating the latter, whereas the differences between the North and South Island forms justified the splitting into two species as each evolved independently towards flightlessness. 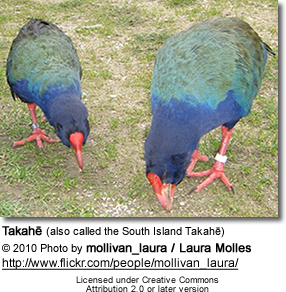 The Takahe is the largest living member of the Rallidae; its overall length is up to 63 cm (24.8 in) and its average weight is about 2.75 kg (6 lbs), ranging from 1.8-4.2 kg (4-9.2 lbs). It is a stocky bird, with reduced wings, strong legs and a massive bill. 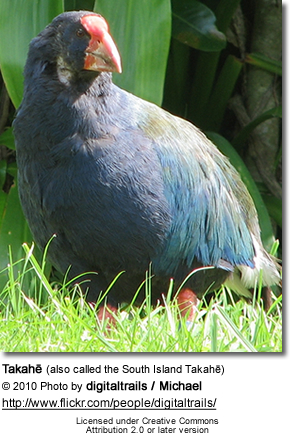 The adult Takahe is mainly purple-blue in colour, with a greenish back and inner wings. It has a red frontal shield and red-based pink bill. The legs are pink. Males and females look alike, the females being slightly smaller, but young birds have mainly pale brown plumage. This is a noisy species with a loud clowp call. The species is still present in the location where it was rediscovered in the Murchison Mountains. Small numbers have also been successfully translocated to four predator-free offshore islands, Tiritiri Matangi, Kapiti, Maud and Mana, where they can be viewed by the public. 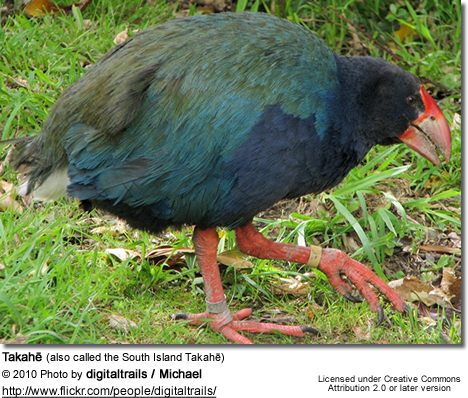 Additionally, captive Takahe can be viewed at Te Anau and Mt Bruce wildlife centers. 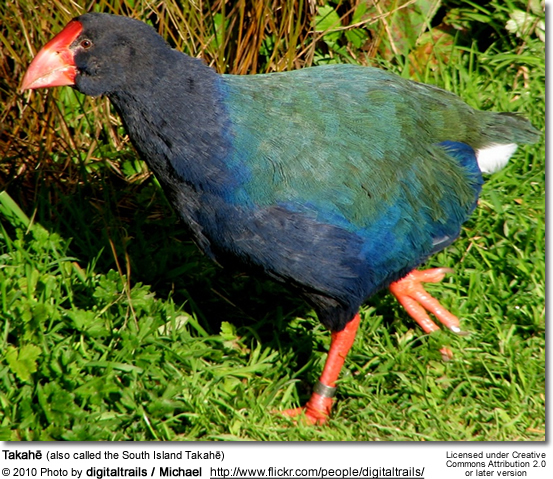 In June 2006 a pair of Takahe were relocated to the Maungatautari Restoration Project. In total there were 225 remaining birds, but in July 2008, a Department of Conservation worker shot one on Mana Island, after mistaking it for a pukeko during a cull. The near-extinction of the Takahe is due to a number of factors: over-hunting, loss of habitat and introduced predators have all played a part. Since the species is long-lived, reproduces slowly, takes several years to reach maturity, and had a large range that has drastically contracted in comparatively few generations, inbreeding depression is a significant problem. The recovery efforts are hampered especially by low fertility of the remaining birds; genetic analyses have been employed to select captive breeding stock in an effort to preserve the maximum genetic diversity. 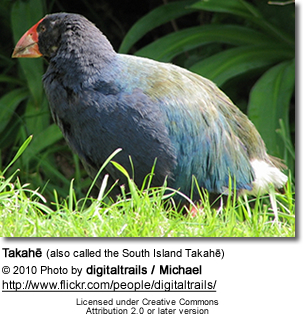 The Takahe is found in alpine grasslands habitats. It eats grass, shoots and insects. 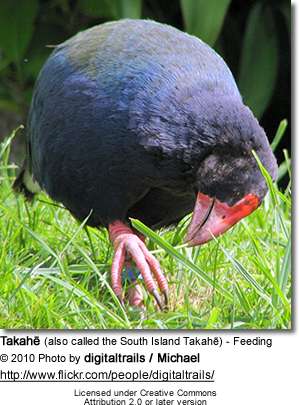 The Takahe; can often be seen to pluck a snow grass stalk, taking it into one claw and eating only the soft lower parts which is a favorite food. The rest is discarded. This species builds a bulky nest under bushes and scrub and lays two buff eggs. It is territorial. The chick survival rate is 73-97%.